A series of three storms over a course of several days created headaches for state Department of Public Safety officials. The wet and sometimes snowy and icy conditions created by the storm, which dropped 1.66 inches of rain on Pahrump over the four days, increased incidents on State Route 160 between Pahrump and Las Vegas and put road work crews into overdrive. The Nevada Highway Patrol said that 15 crash incidents that occurred between Jan. 19 and Jan. 24 took place on SR-160, with the majority of those occurring between State Route 159 on the Vegas side of the hump and mile marker 16 on the Pahrump side. NHP said that there were nine property damage crashes, six injury crashes and one vehicle fire during the storm period. Nevada Department of Transportation crews put in longer hours while clearing the way on SR-160 in Mountain Springs. 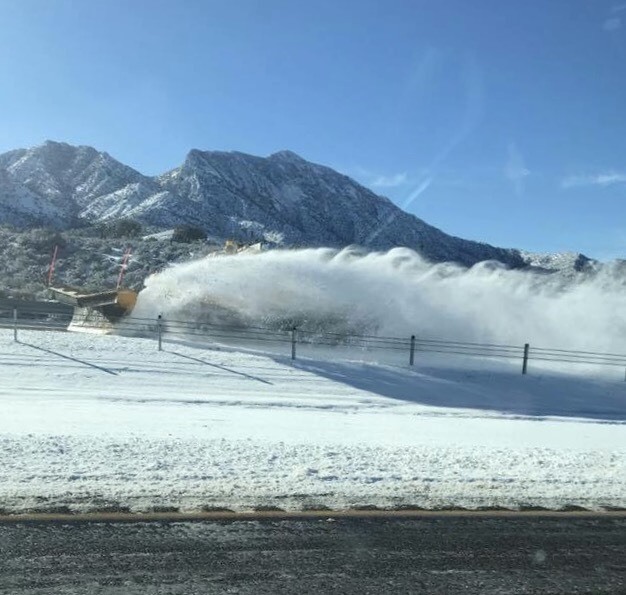 “The department’s four-person Spring Mountain maintenance crew worked overtime, operating two snowplows around the clock and spreading about 100 cubic yards of something called ‘Ice Slicer’ over the roads,” said Tony Illia, NDOT spokesperson. It’s an all-natural, high-performance product that debonds ice from the road surface 65.3 percent more effectively than standard white salt, and melts up to double the snow and ice after one hour. It’s also 40 percent less corrosive than standard white salt, with a 14-degree lower freeze point. Results of the department’s overtime showed, as the highway never had to shut down and snow chains were never required during the three consecutive storms. “(This is) despite seeing the most snow crew members I can remember seeing in nearly 10 years, “ Illia said. The pair of widening projects on SR-160, one in town and one over the hump on the Las Vegas side, weren’t affected by the storms. Illia said all that remains is a final three-quarter-inch open grade concourse, which will be completed in the spring once the weather improves. Cold weather can cause asphalt pavement to cool too quickly, making it difficult to achieve the proper compacted density. As for the $16.5 million widening of SR-160 in southwest Clark County, that project also remains unimpacted by the storms.